Feodor Felix Konrad Lynen was born on April 6, 1911 in Munich, Germany. His father, Wilhelm Lynen, was a professor of mechanical engineering and his mother, Frieda, was the daughter of an industrialist. Lynen completed his primary and secondary education in Munich and attended Munich University studying chemistry. He completed his Ph.D. in 1937 with a dissertation identifying the toxic substance in amanita mushrooms. 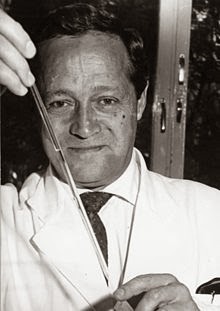 After graduation Lynen remained at Munich University becoming a chemistry lecturer in 1942, an assistant professor in 1947, and biochemistry professor in 1953. When World War II broke out Lynen was exempt because of injuries he sustained in a skiing accident. In 1956 he became director of the Max Plank institute for Cellular Chemistry. Lynen's research dealt with determining the biochemical pathways by which cells produce fatty acids and sterols. Working with Konrad Bloch, he discovered the pathway by which cholesterol is synthesized. Later he determined the structure of acytel-coenzyme A. Acetyl-CoA is an important biochemical intermediate. It feeds two carbon acetic acid fragments from glycolysis (the initial steps by which cells break down glucose) into the citric acid cycle to generate cellular energy. It also is the basis of fatty acid and cholesterol synthesis using the two carbon acetate to build longer carbon chains to store energy or produce bigger carbon molecules. For their work Lynen and Bloch were awarded the Nobel Prize in Physiology and Medicine in 1964. Other awards won by Lynen include the Grand Cross of Merit with Star and Sash of the Federal Republic of Germany in 1965, Norman Medal of the German Society for Fat Research in 1967, the Pour le mérite für Wissenschaften und Künste in 1971, and the Austrian Decoration for Science and Art in 1972. Lynen died on August 6, 1979.